We both attended Alaska Bible College, where we met and married. It was there that God turned our hearts towards the people in Alaska. 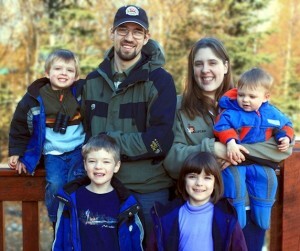 As of 2009 we are serving in Tok, Alaska where we are interning with the local pastor in preparation to serve as church planters in a more remote location. We have four children. Andrew (son) and Renee (daughter) are twins born in 2005, Nathan was born in 2007, followed by Todd who is eighteen months old. We strive to live exemplary Christian lives as Church planters living in western Alaska and to be intentional in our efforts to communicate the good news of Jesus Christ providing salvation to all who will receive Him.